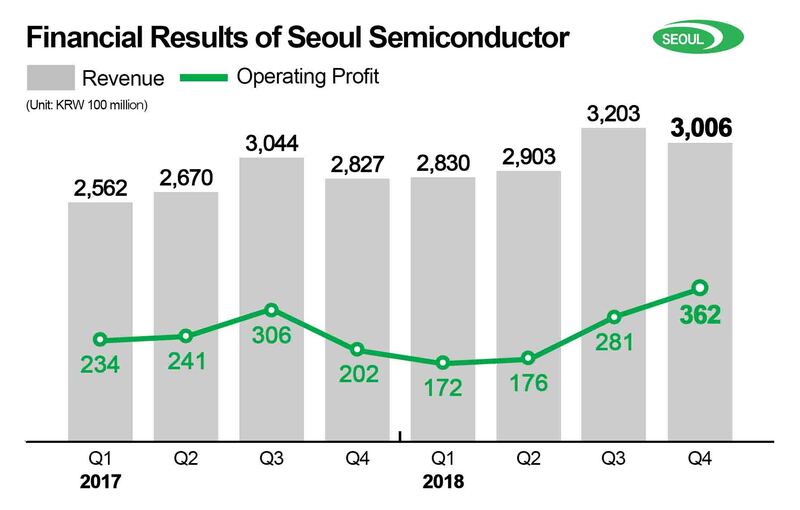 Seoul Semiconductor reported its 2018 fiscal year consolidated revenue of KRW 1194.2 billion (US$1.07 billion) with an operating profit of KRW 99 billion (US$ 88.6 million), as well as a net income of KRW 65.4 billion (US$ 58.53 million) to report two year consecutive sales growth. As a result of stabilization of Seoul Semiconductor’s new manufacturing plant in Vietnam and improved product mix, the consolidated fourth quarter revenue increased by 6% YoY to KRW 300.6 billion (US$ 269.04 million), while operating profit amounted to KRW 36.2 billion (US$ 32.4 million), rising 79% YoY. According to Seoul Semiconductor, its revenue growth resulted from an increase in global TV customer demand of its differentiated technology WICOP, an innovative product line of package-less LEDs. Meanwhile, the company achieved a double-digit growth in automotive headlamp lighting with its advanced technology nPola which enhances the reliability and power output of automotive headlamp. For the first quarter of Fiscal 2019, Seoul Semiconductor expects to reach sales of KRW 280 billion to 300 billion (US$ 250.6 – 268.5 million) with continued on-year growth. As for new technologies, Seoul Semiconductor is preparing to introduce its innovative offering of Micro LED products and plans to expand its customer base by launching LED Drivers with Acrich technology. In addition, the company is set to mass produce IR LEDs and VCSEL iris scan, facial recognition and autonomous driving.